There are worlds beyond the one we know: Planes of Fire and Water, Heaven and Hell, Dimensions of Dreams and Time. These are the realms of angels and demons, gods and goddesses�entire new realities where anything can happen! 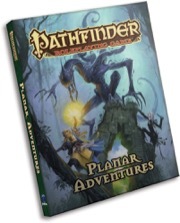 Pathfinder RPG Planar Adventures expands the world of the Pathfinder Roleplaying Game and transports your characters and campaigns into uncanny new worlds rife with both perilous dangers and unimaginable rewards. In these infinite planes of reality, characters will test more than just their mettle against the daunting challenges that confront them�they'll test their very souls! All-new archetypes, feats, magic items, and spells to give plane-hopping PCs a bounty of options during their travels. A presentation of the 20 core deities of the Pathfinder RPG, including divine gifts they can grant their faithful. An exploration of the major planes of existence and several strange demiplanes from the Pathfinder campaign setting. Nearly two dozen new monsters, including three new races appropriate for use as player characters.